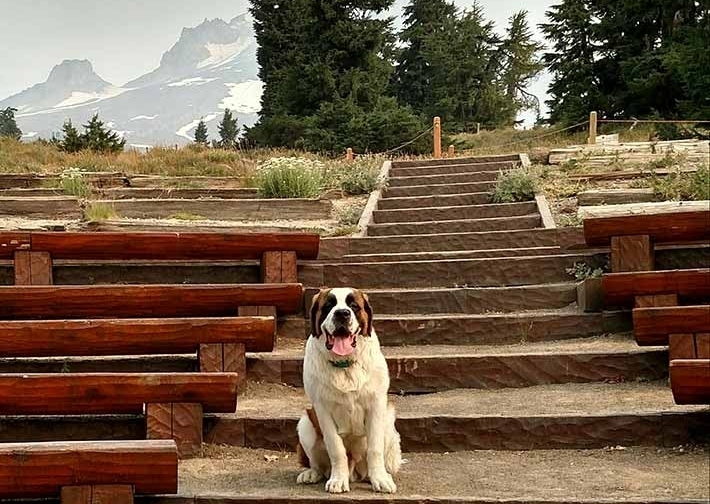 Since the Timberline Lodge was built in 1937, the tradition of having resident St. Bernards has lived on through the decades and is a favorite of our guests. The tradition continues to this day with Heidi and Bruno. Oregon’s historic Timberline Lodge is a place of traditions. 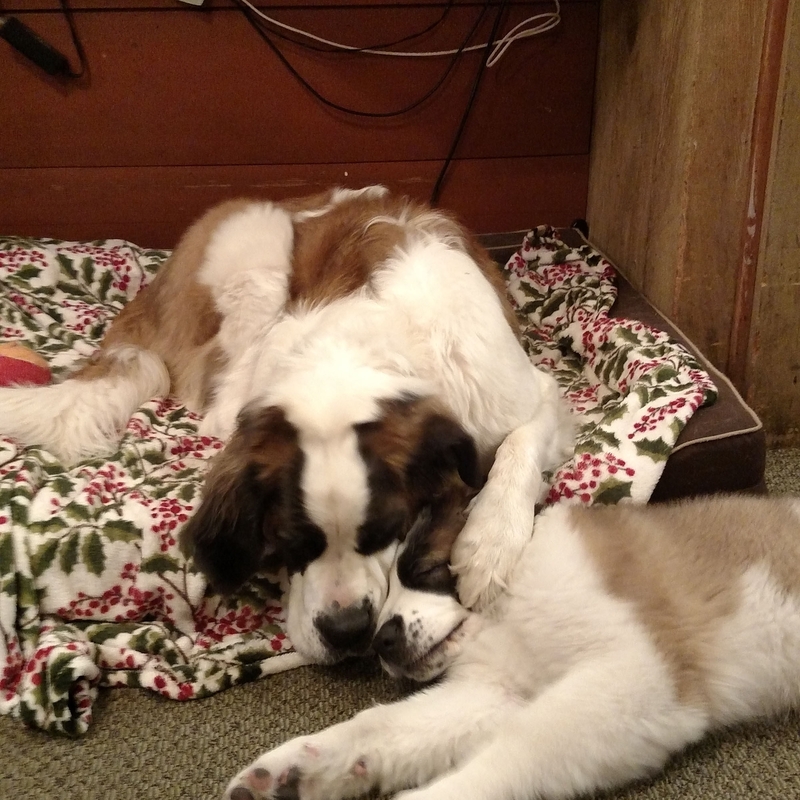 One such tradition continues with our two St. Bernards, Heidi and Bruno. 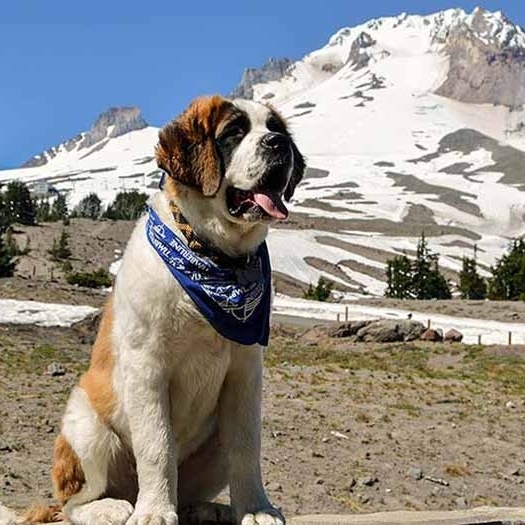 Learn more about Timberline's beloved St. Bernards, iconic dogs for an iconic lodge. 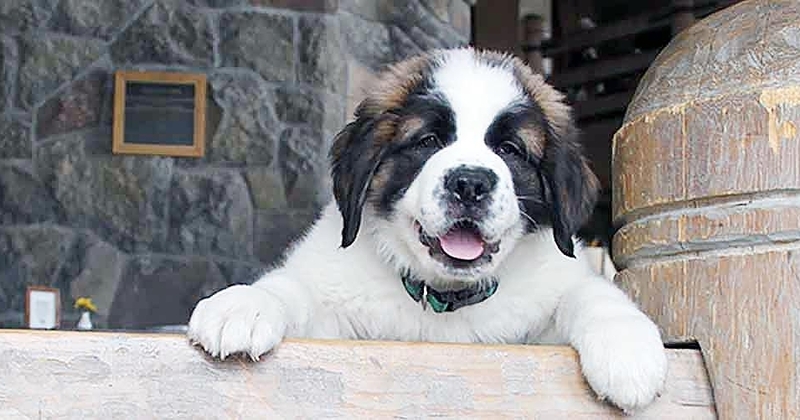 St. Bernards are commonly associated with snow-capped mountains. These large dogs are resistant to cold and have an uncanny sense of smell and direction. 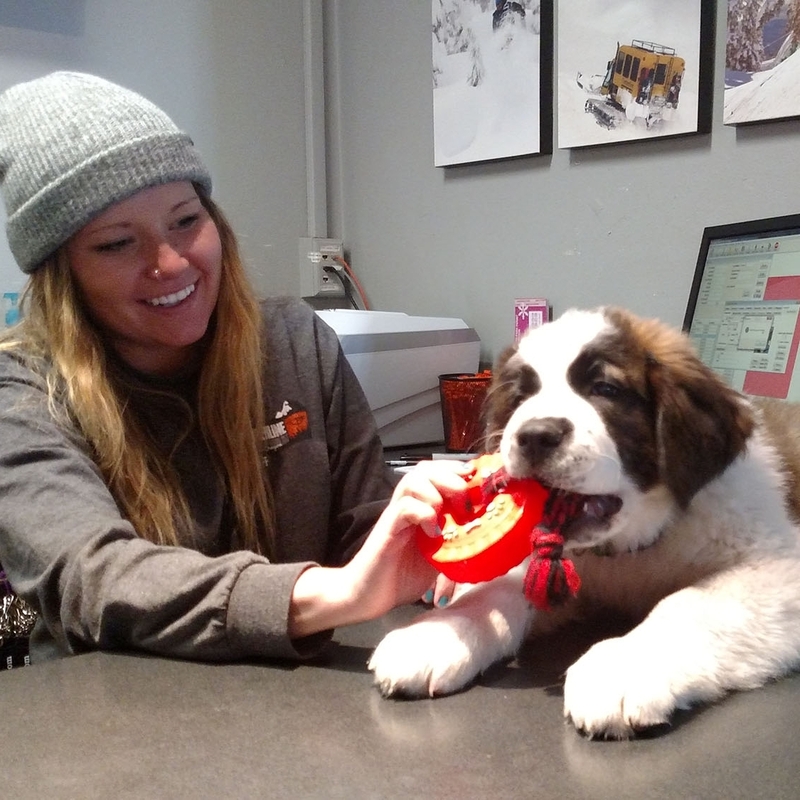 They earned their name for saving lives in the Alps’ St. Bernard Pass between Switzerland and Italy in the 1700s. 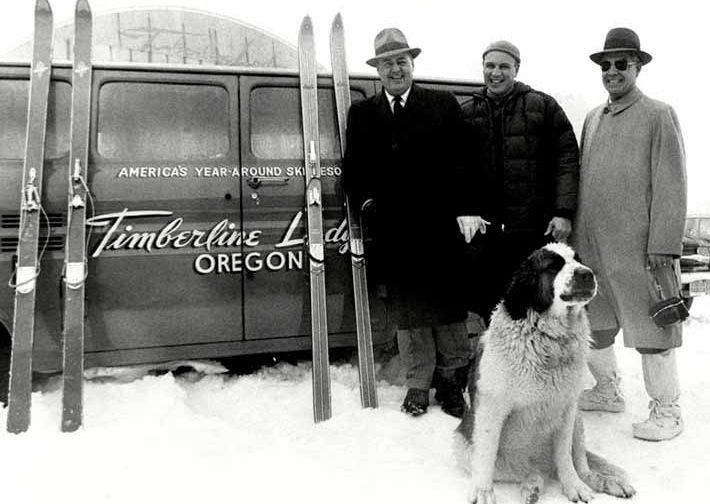 St. Bernards have been a part of Timberline’s traditions since 1937, when Franklin D. Roosevelt dedicated the lodge. 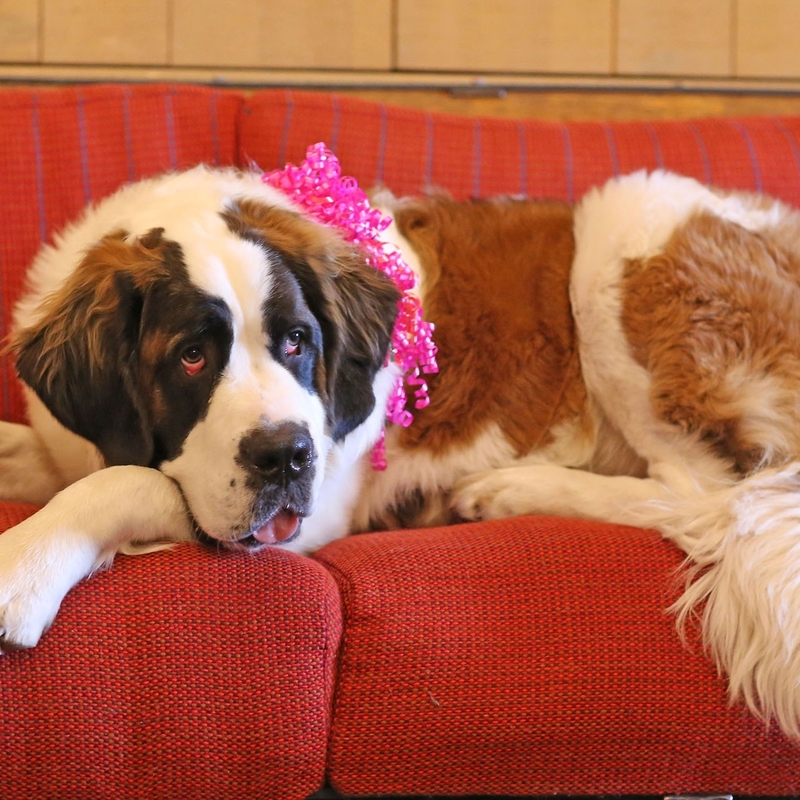 The first Timberline St.Bernards were reportedly Hansel and Gretel, and then Lady and Bruel. 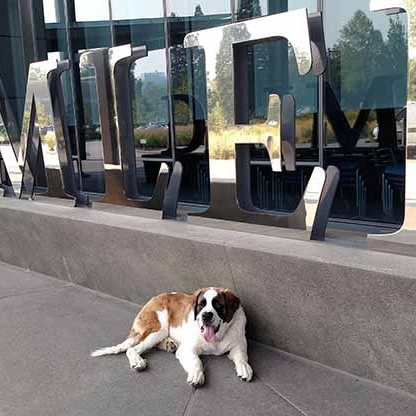 For a brief time, the St. Bernard mascots were replaced with Huskies when the Kohnstamm family took over management of the lodge in the 1950s. The first mascot under the Kohnstamms’ watch was Mac, who belonged to an employee. Then, due to popular demand, the Kohnstamms reintroduced St. Bernards. 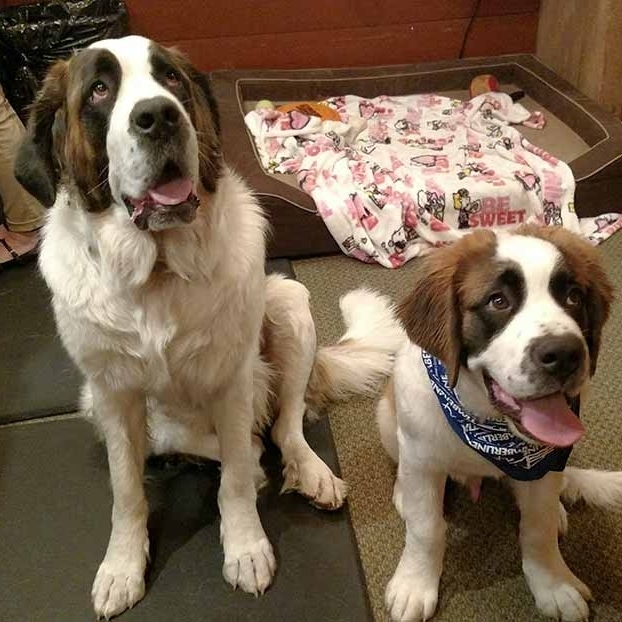 Since the early 1960s the lodge has had St. Bernards named Heidi and Bruno. They lived at Timberline, had free-roam of the building, and greeted countless visitors, skiers, and climbers. 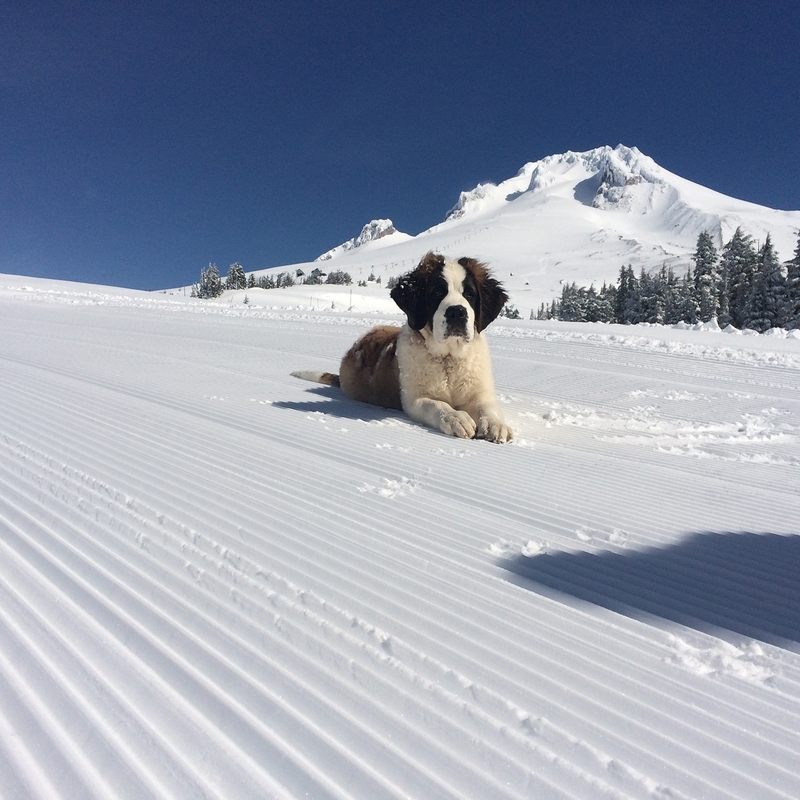 The dogs have been featured in the ski area’s brochures, ski pins, posters, and on Timberline Lodge matchbook covers. In the 1980s a children’s book, Heidi’s Rose, was published. In more recent years, the dogs have been featured in many of the outdoor-oriented fashion catalogs that are often photographed at the lodge. Guests can also purchase their own plush Heidi or Bruno at Timberline’s gift shops. a wonderful solution involving employees. 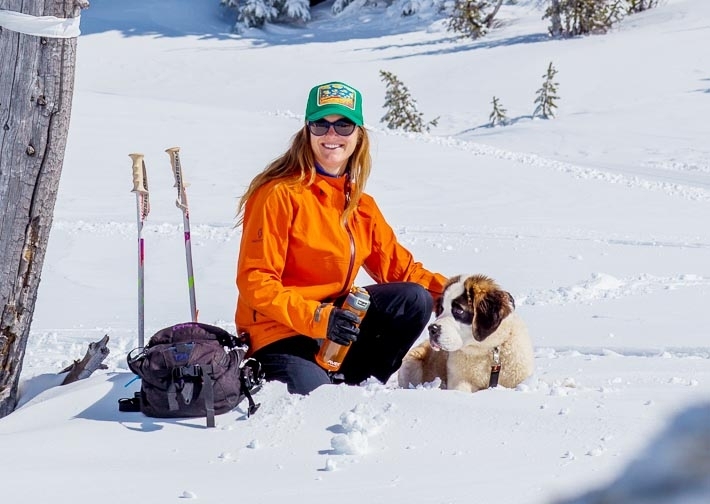 Since that time, rather than allow the dogs to live independently at the lodge, Heidi and Bruno have belonged to long-term employees who become their primary caregivers and alpha masters. 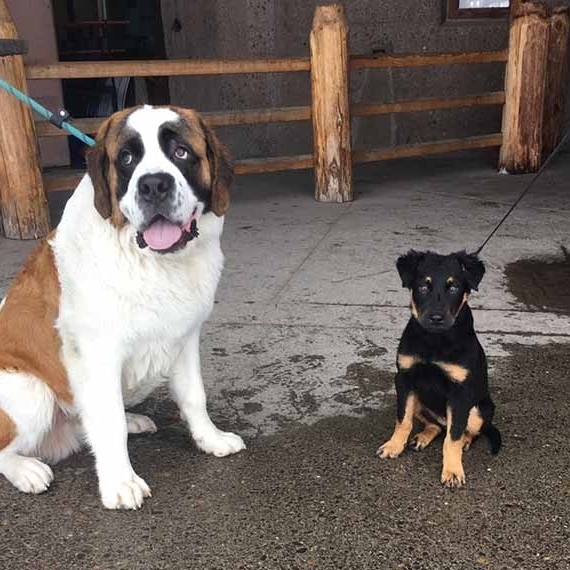 The dogs cheerfully come and go to work with their appointed alpha master, still spending most of their time at the lodge carrying on the tradition and bringing happiness to Timberline’s many visitors. A true Timberline experience! 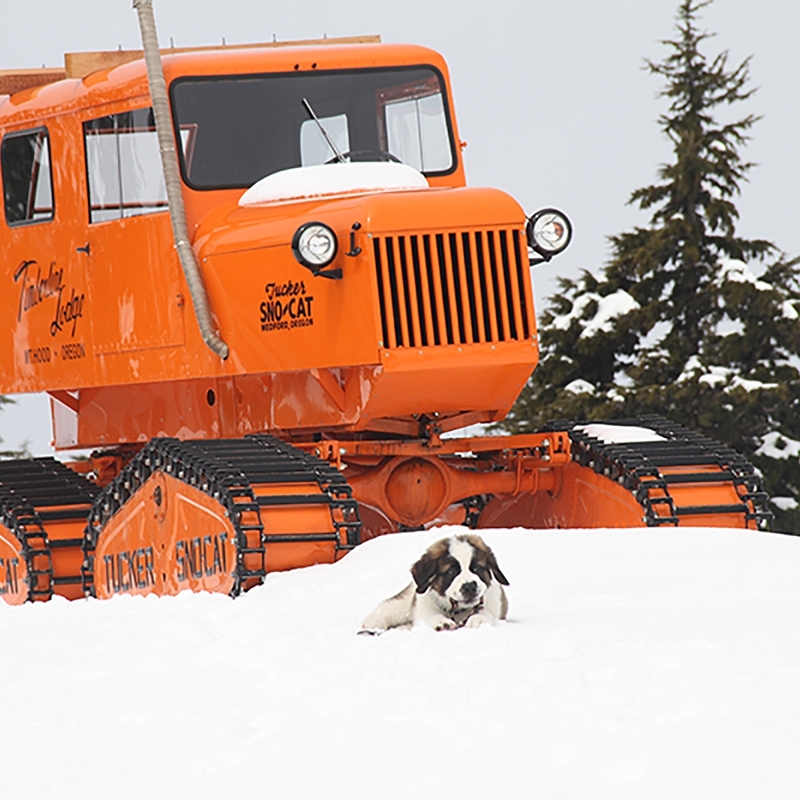 Enjoy a leisurely hike or snowshoe with our St. Bernard mascot and their handler. Hikes are 45 min and begin from the lodge. Bottled water, trail mix, and doggie treats included! Available Thursdays through Mondays with 72 hours advance reservation. Cost $125. Please call 800-547-1406 for reservations. Starting June 1, Bruno will be on a regular walking schedule. He'll be out and about at 10am, 12pm, and 2pm most Tuesdays through Saturdays. Bruno spent the summer and early fall camping, swimming, and going on long walks to build up his endurance. Some of his walks were simply going up the mountain until we hit snow that he could play in. We’ve discovered he LOVES Plato Pet Treats, especially the salmon ones. Either he’s a quick learner, or these treats are the perfect motivator! He’s settled into his job of greeting guests very well and does a thorough job of making sure he says hello to everyone when we head out of the office. He’s super excited about the new snow we’ve been getting lately so we’re in for some “active” snow play times this winter.